May 24, 2013: The Project thanks Gypsy Lee for the donation of her vintage 1970's Cher Indian costume and headdress worn at a Mandrake Ball and some early pageants. The Project hopes to display the outfit at our St. Louis Pride display in June. Thanks Gypsy Lee! 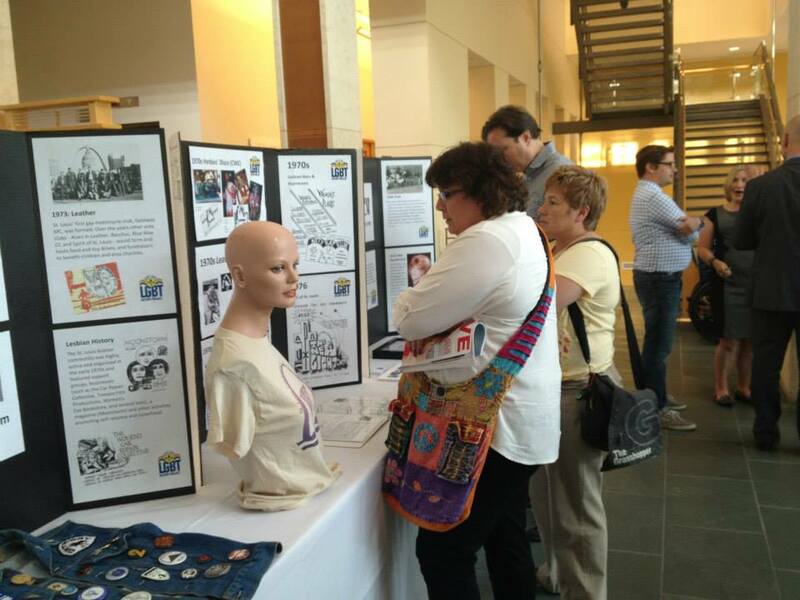 May 16, 2013: The Project was happy to provide a display for the May 15 "Out in the City" event sponsored by ALIVE Magazine and hosted by the Missouri History Museum to benefit the LGBT Center of St. Louis. More than 150 people attend the event that raised more than $600 for the Center. The Project is a program of the Center. The Project is also working with the Missouri History Museum as they plan for a special 2014 exhibit that will celebrate the City of St. Louis' 250th birthday. More details to come. 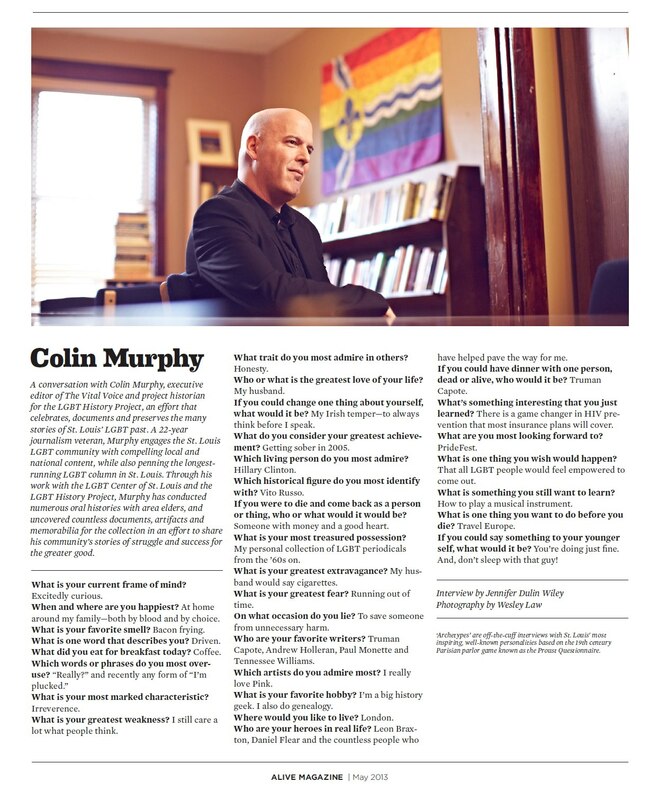 April 30, 2013: The May 2013 issue of ALIVE Magazine highlights Colin Murphy, one of the Project's Historians and the Executive Editor of the Vital Voice. Learn about Colin and his love of history in this month's Archetypes feature of ALIVE. 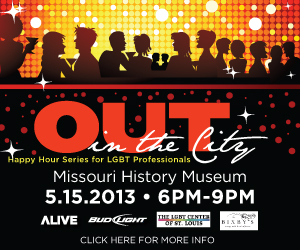 April 26, 2013: On May 15, join Bud Light, Pinnacle Vodka, ALIVE Magazine and the LGBT Center of St. Louis at Missouri History Museum for St. Louis' most happening happy hour for LGBTs. This month's suggested $5 donation will not only get you two complimentary sponsored drinks but also directly benefits the LGBT Center of St. Louis.The St. Louis LGBT HIstory Project is a program of the Center and will have an educational display at the event. Non-alcoholic drinks are also provided. May 15, 2013, 6-9 p.m.